Throughout the school year you are asked to “show what you know” by completing an assessment, or test, that asks you to read a passage and respond to what you read. In this experience you will learn and practice strategies that you can use when you are asked to respond to a writing task on a test. You will analyze a writing prompt to figure out what the question is asking you. 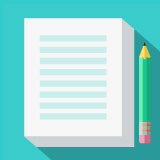 Using a shortened version of the writing process, you will then plan and write a response for the writing task, knowing that there is a time limit. What can you learn about personal responsibility from the example of Little Boy Blue? Cite evidence from the text. Make a connection to something that has happened in your own life.